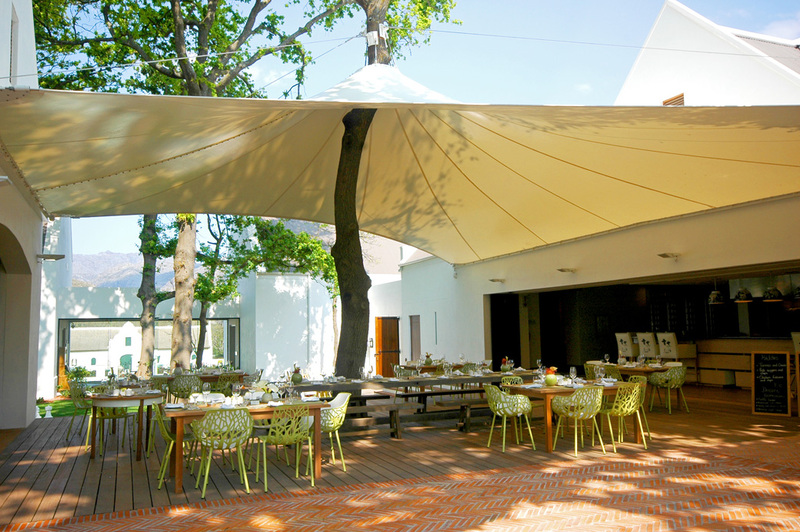 Having designed stunning wine estate structures with Malherbe & Rust Architects before, Tension Structures was approached when La Motte was looking for a canopy over their outside seating area at their restaurant. With a perfect setting and century old oak trees, all that was left was for TS to thread an aesthetically complimenting structure into place. This was a little easier said than done as it was necessary to engineer for an oak tree to support the canopy. Tension Structures met the challenge and the old oak proved to be a worthy mast. This structure appeared on the cover of the Western Cape April 2011 Edition of Property Magazine.